Demonworld RPG Core – FASA Games, Inc. In the midst of war and political posturing, the demons returned. No one was prepared for the chaos and death that seeks out every last living thing on Garin. Now, struggling to find any safe haven, the races of Garin have been forced to ally with those who have been their enemies for centuries. At first, the task seems laughable. The Races can hardly occupy the same room, let alone negotiate peace treaties. But a race of Elves long forgotten returns to their home continent of Tinére and brings a dark hope with them; the power to control demons. 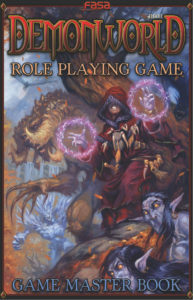 Demonworld: The RPG uses the Corestep rules system to help bring life to the setting. Players take on the role of Specialists; individuals trained in one of thirteen unique vocations. The combined armies of Tinére rely on these Specialists to lead their armies, protect their cities, and destroy the demons at all costs. Make magic your weapon of choice with spell-slinging Archivist, the reality-warping Conjuror, or the elemental Shaman. Or take enemies on with steel and speed with the Blademaster, Lancer, or Beastrider. Or perhaps you’re more interested in the singular Demonguard who combines demonic magic with combat prowess to the devastation of the demon forces. needs to create characters, learn the rules of the game, and become familiar with the setting. Delve into the seven featured playable races, thirteen character Specialties, and all the maneuvers and spells your characters will employ. The book also includes brief histories on each of the races, descriptions of the major regions of Tinére, and profiles on various important people, deities, and factions. The races that populate Tinére are a mix of the familiar and the unexpected. Humans, Elves, and Dwarves are all present, albeit with some surprising twists. Orcs and Goblins are also among the playable races, and we think you’ll find them interesting. The newest additions are the Dark Elves, which fans of Demonworld might recognize from the 2nd Edition of the Miniatures game, and the Entomids, and insectoid race that makes its first appearance in the Demonworld Player’s Guide. 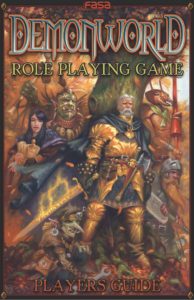 The Gamemaster’s Guide includes all of the information needed by Gamemasters to run a game of Demonworld. It includes advances rules, tips on how to deal with sticky situations, adventure ideas, a library of magical artifacts, and, of course, a bestiary and demonicon to provide players with worthy challenges. Gamemasters will find this guide useful when posed with unusual situations that might need some rules clarifications, or when they need to reward players for a particularly difficult session. As a bonus, the guide includes a chapter on the villains of Demonworld and touches on their motivations and dastardly plans. Our development team is working hard to produce a quality product that you will enjoy and that we are proud of. Stay tuned for more updates.